Hello! We are The Lewisville Dentist in Lewisville. Thanks for visiting our dental blog. The topic of today’s post is malocclusion – literally – “bad bite”. Edward Angle, a pioneer in modern orthodontics invented the term malocclusion. Malocclusion is fairly common in the population as a whole but, fortunately, in most cases the misalignment is so slight that it causes no problems. When you combine multiple teeth on two arches and a jaw joint with a considerable range of motion, it is easy to see how these elements can fail to align properly. In fact, it is a wonder that they work correctly for most people – allowing them to talk, eat, and breathe without giving it a second thought. There are many causes of malocclusion – some originating with the teeth and some originating with the jaw. Misshapen teeth, extracted teeth, impacted teeth, crowded teeth, and widely spaced teeth can influence the bite. Injury to the jaw can also cause malocclusion as well as improperly fitting restorations and other dental appliances. Children with a normal bite can develop bite issues with prolonged pacifier use, thumb sucking or bottle drinking. In rarer cases, oral tumors can move a bite out of alignment. The treatment for malocclusion depends on the cause. Orthodontics can move teeth into alignment to repair bite troubles. Overcrowding often requires extraction of one or more teeth. 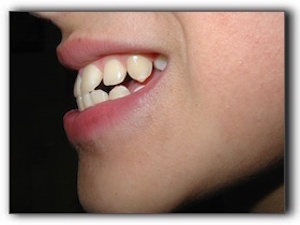 Misshapen teeth that affect the bite can often be repaired with crowns or dental bonding. If the jawbone is significantly misshapen or misaligned, maxillofacial surgery may be required. Jaw surgery is a serious undertaking with significant risks and a long, painful recovery. While the jaw heals, it is secured with wires and screws. Ouch! If your jaw hurts or you notice unusual wear to your teeth, it is vital that you are examined by a professional. Call 214-488-5505 to schedule an appointment with The Lewisville Dentist. Our involved dental team has been serving patients at our comfortable Lewisville office since 2003. We can give you more details about malocclusion, Invisalign sedation dentistry, or dentures. We advise Lewisville parents about important issues such as tooth development, thumb-sucking, water fluoridation, dental sealants, oral sports protection, and orthodontia. If you suspect that your child has any degree of malocclusion, schedule an exam ASAP. Untreated bite problems in children can inhibit proper nutrition, breathing, tooth development, and speech development. Lewisville Dentist Dr. Natalie Goodman provides exceptional cosmetic dentistry, dental implants, sedation dentistry, family dentistry and more to the Dallas - Fort Worth metro area including Lewisville, Flower Mound, Coppell, Valley Ranch, Grapevine, Lantana, zip codes 75067, 75019, 75077, and Southlake, Texas.